New @ View, The Gallery! 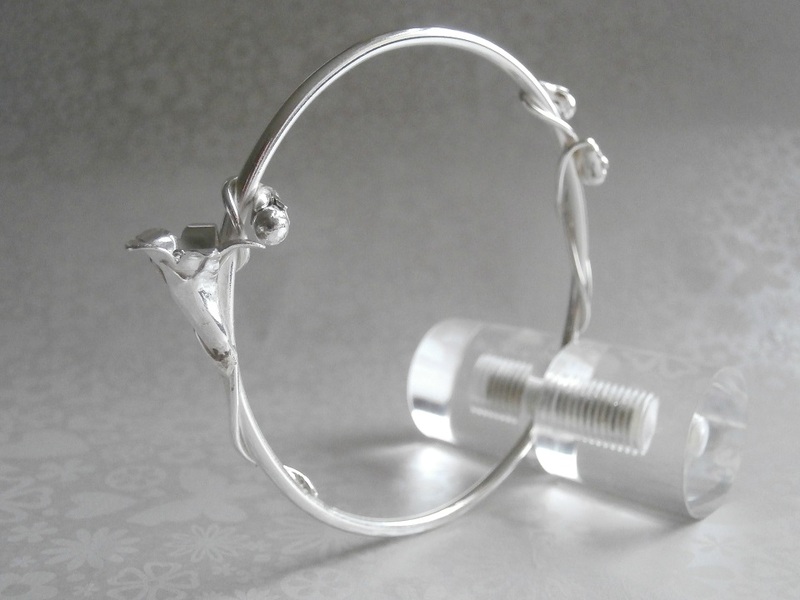 Charlotte Bouchard Jewellery can now be found at View, The Gallery near Okehampton. View is a brand new gallery created by Gill and Derek who in their own words ‘appreciate the wealth of creative talent in the West Country’ and wanted to open a gallery to celebrate and promote that creativity and wide range of craft. The view from the gallery itself is outstanding and, as it changes constantly with the seasons, weather and the light, is a perfect backdrop to the high quality artwork on sale. If that isn’t enough to tempt you to visit, the café also serves up some tasty cakes and treats including handmade luxury ice cream! Hope that you might make a visit if you are passing! Why not come along and see me at what promises to be an amazing weekend of style and entertainment? As well as all that is on offer from the main event, I will be trying out my first Blue Fizz Bridal event in the Very Vintage Wedding marquee. With a wide range of jewellery inspired by antique floral themes and incorporating vintage buttons and lace as well as little love birds and plenty of hearts and sparkles, there should be something for everyone. 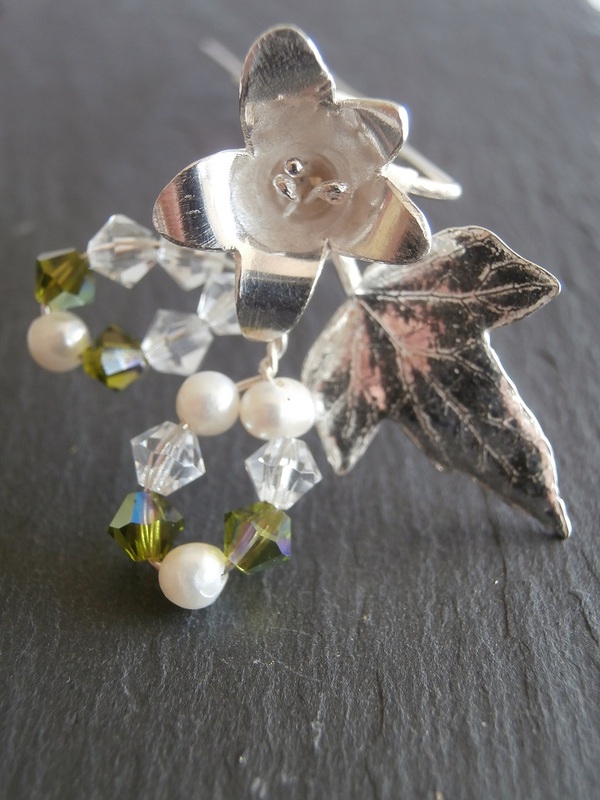 My jewellery is suitable for all special occasions because I believe we all deserve something beautiful, don’t you? One of the nicest things about selling at events is that you get to meet such really lovely people. Not just the visitors and customers who give you such great and honest feedback but also the other exhibitors, organisers and support team. At the weekend I spent a couple of days alongside several local businesses who were new to me including Made by Rose Red , Raindrop Yarns, Blueberry Hill Vintage and Onlyinthewild . It’s so nice to be able to get to know other people with small or evolving businesses, share our experiences and listen and give each other advice. More than that though, it is great to appreciate and be inspired by other people’s creativity and enthusiasm for what they do. Although it is often exhausting to prepare and attend these events, I always come back with a new energy and can’t wait to get back out in my workshop. Events such as the Miss Ivy’s Revival at Cockington Court, Devon don’t just spring up overnight so also a big thank you to everyone who was involved in the months of planning and organisation as well smoothing out any problems on the days, especially Marissa at the Torbay Development Agency and Joanne and her team at Miss Ivy Events. 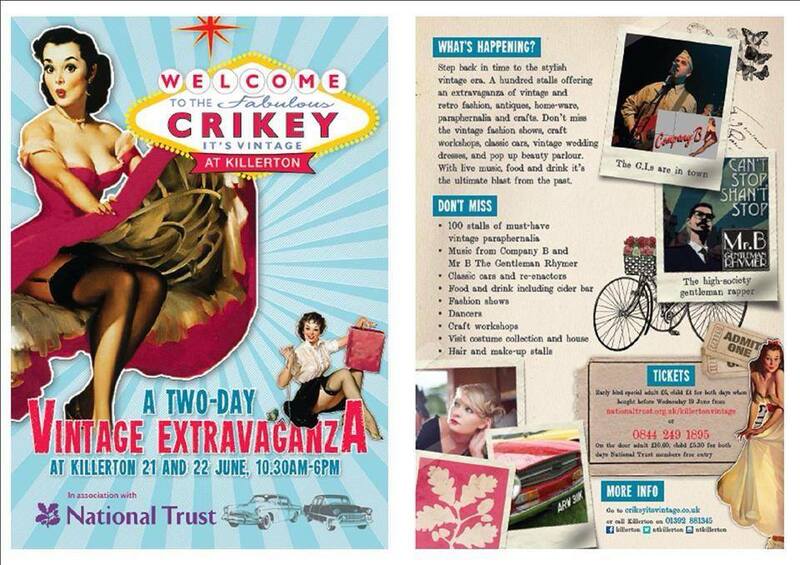 So, I’ve got to go now and get making and ready for the Crikey It’s Vintage event at Killerton House on the 21st and 22nd of June where I will be exhibiting a new collection of pieces suitable for weddings and special occasions. Looking forward to it and hoping to see you there! A Good Old Fashioned Day Out! My next outing with Charlotte Bouchard Jewellery will be on Saturday 31st May and Sunday 1st June 2014, 10.30am- 5.30pm at Cockington Court and Country Park, Torquay. This looks like it is going to be a really fun packed event and I hope that some of you may pop by for a visit. 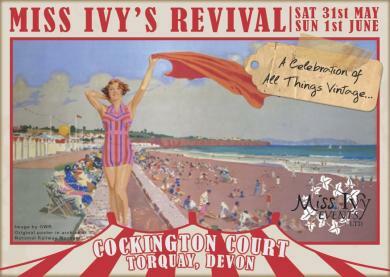 The two day celebration will be full of live music, dancers, children’s entertainment and lots of stalls including vintage clothing, brocante and crafts, vintage vehicles, retro catwalk and Miss Ivy’s very own vintage cinema. Or why not get your glam on in the makeover parlour, photo booth, and enjoy the ‘make-do and mend’ themed workshops. Miss Cherry Bomb, City Steam Jazz Band, Retro DJ, Swing and Lindy Hop dancers, Punch and Judy, Elfic the Jester, Dan Brazier the Magician, Falconry, World War reenactment tent. Workshops from Puddleducks, Honeysuckle Homes and Agathas Closet. Plus a fascinating collection of archive footage of Torbay through the years. Plus so much more! No matter what your interest or age, this event will have something for everyone! 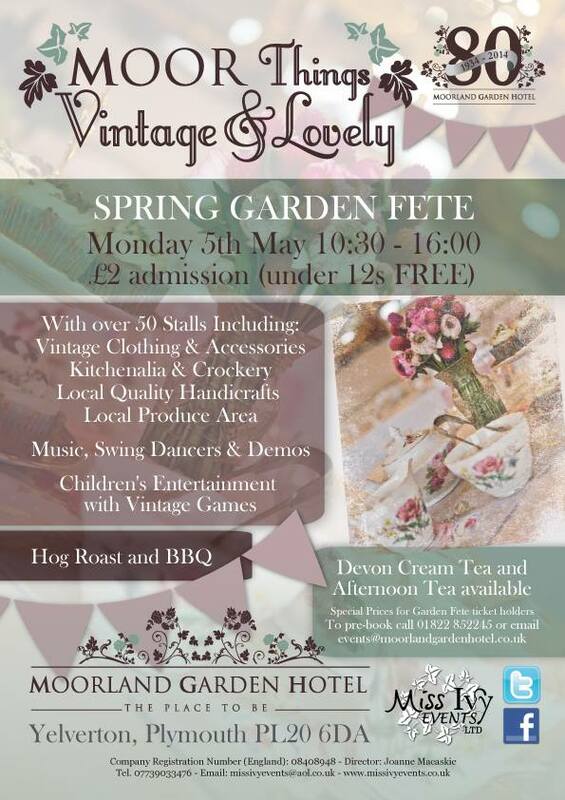 Bring the family and enjoy this new event for Torbay! Supporting local charity Torbay Holiday Helpers Network. Counting down to what promises to be a great day out for all. A few words about commissions and design. Well that was a great start – on the first day of having my jewellery at The Fountain of Health in Teignmouth – they sold 2 pairs of earrings by lunchtime! If you are in the area, why not pop by and take a look at my work as well as the gorgeous block printed Fair Trade scarves which Sara designs and has made in Jaipur. Here is another picture to tempt you. Let me know what you think…. Today I’ve been setting up a display of my jewellery at the Fountain of Health shop in Teignmouth. Here is a sneak preview. 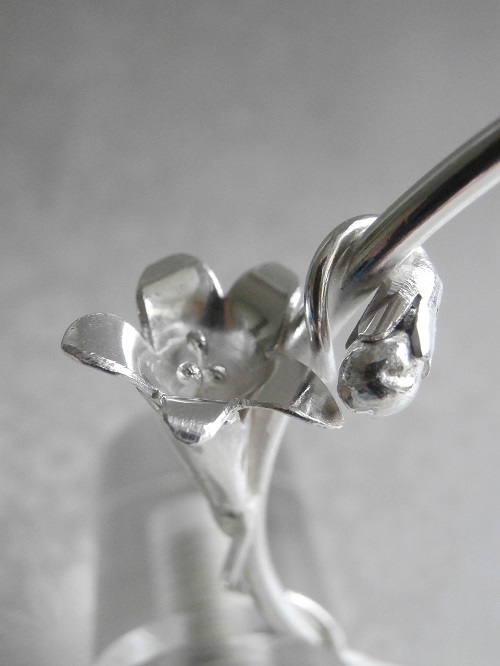 Jewellery available to buy from Saturday 29th March- just in time for Mothers Day.